The desire to remove all unwanted hair from the body today has become more pronounced than ever. 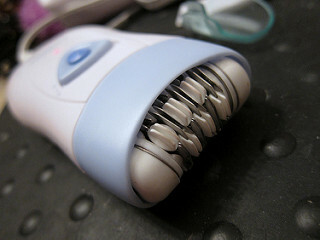 There are many options for getting rid of body hair, focusing mainly on the armpits, legs, arms, face and the pubic area. The methods are different in their effectiveness, duration, amount of discomfort they cause and other aspects. The most popular ones are razor shaving, hot and cold wax, depilatory creams, electrolysis and many more. At one point, the device called electronic tweezers was very popular and highly advertised, but today there is little or no mention of it, probably because it turned out to be much less effective than advertised. Tweezers are tools used to pick up and manage objects that are too small to be handled with human fingers. They are made of two levers connected at one end and with pincers on the other. They are usually made of metal. Among other purposes, tweezers are used to pull out hair. For example, they are widely used for stylizing the eyebrows. Electronic tweezers were the essential part of a device called Depilatron, designed to remove undesired body hair. The device had an electric machine with tweezers connected to it. The inventors of this device claimed that when a hair is grasped with tweezers, they send electric current straight to the hair follicle, killing the root permanently. This was supposed to remove the hair for good. There was one major problem with that concept, one that could have been avoided if the device was properly tested before releasing it. The hair cannot conduct electric current and therefore it is not possible to send the current to the hair follicle like that. Depilatron was widely used in cosmetic salons, even in the high-end ones. The customers were, of course, disappointed once the hair started growing back, even though it was promised otherwise. Soon after the release, the device was pulled from the market. Even after the Depilatron fiasco, there were similar attempts to sell devices with electronic tweezers. Needless to say, none of them lived up to the promise of providing permanent hair removal. They did pull the hair pout, but it just grew right back after a few weeks. Electronic tweezers were advertised as a painless and less expensive way to remove hair permanently, comparing it to electrolysis. However, electronic tweezers proved to be ineffective while electrolysis remains one of the best and most reliable methods of permanent hair removal. What methods are there for permanent facial hair removal? How to reduce the growth of unwanted facial hair? Mole removed, process of healing but not happy..
Is electroloysis better than laser for permanent removal of facial hair? How many laser treatments for permanent facial hair removal? Is permanent removal of facial hair really going to work? Can wax remove my unwanted facial hair? Are there some disadvantages regarding laser facial removal? What is the most effective permanent hair removal system?